Mark and I went to the Model City exhibit at CAF (Michigan & Jackson) a few weeks ago but my silly camera batteries died (and hey, CAF, how about selling batteries in your gift shop?) so I couldn't take the millions of photos I wanted. Yesterday I slipped out early and returned to do the exhibit full justice. Sunrise on the river. The lighting is challenging for photographers because they simulate a 24-hour light change and even the brightest daylight is soft, to reduce shadows. 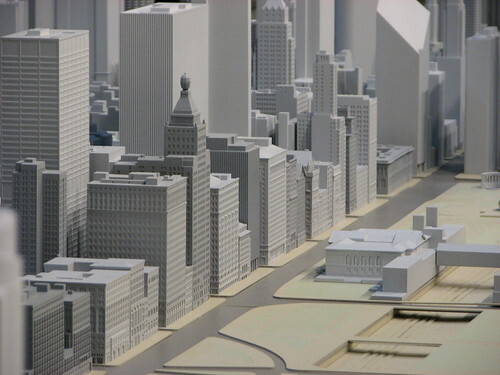 The exhibit is a completely fascinating sight, a scale model of the buildings of Chicago from Roosevelt to Halsted to (hmm, not sure of the north boundary) to the lake. It's a lot of fun to crouch down and see familiar sightlines, and to pick out the buildings you know. It even has a replica of the Bean! I encourage everyone in town to go see it. It was scheduled to close in November but someone from CAF let me know this morning that it has been extended. So no excuses! 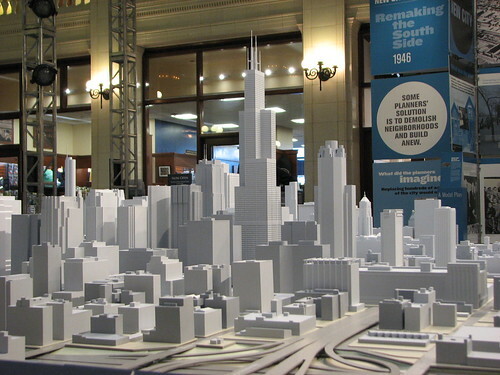 As much as I like scale models (and I'd have to say that would be more than the average person! 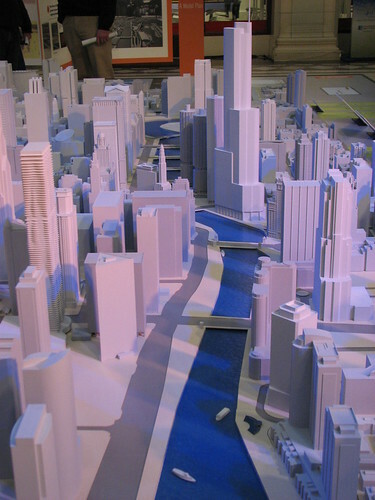 ), the real city sure outshines the model! Though I do like the idea of being able to see my city as a model in a bird's eye view, as it were. This is really cool. I've been meaning to see it all summer but haven't gotten around to it. I wonder if anyone has photographed the entire model and shown what it looks like in real life, like you did. Your pictures are beautiful. I am glad you like this model as we designed and built it for the CAF. Did you know that the companies that printed the buildings did it for free? 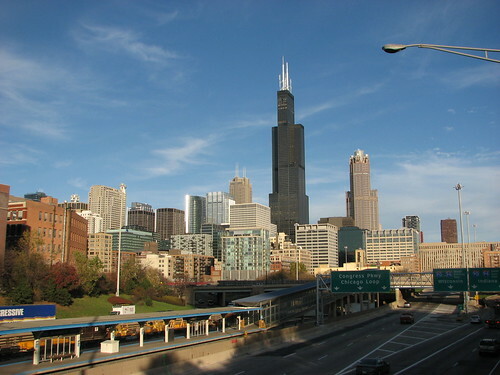 It was a gift to the CAF and by extension the City of Chicago.